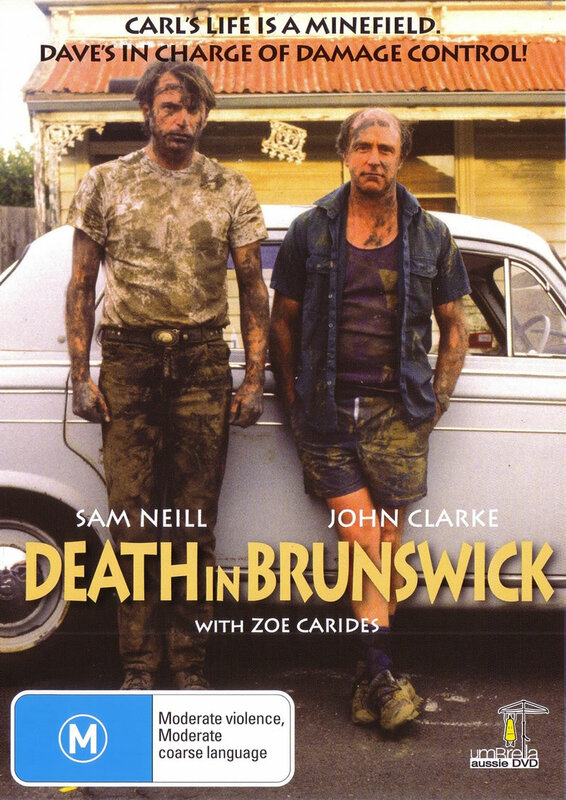 The film Death in Brunswick (also known as Nothing to Lose) was shot in Melbourne and remains one of the funniest Australian comedies. Sam Neill is fantastic - his comedic roles are few and far between, but his timing is immaculate. Carides is in one of her best roles - one may have expected her sister Gia to take more to such a role, but Zoe pulls it off magnificently. But, the best role is Dave played by John Clarke seen on the 7:30 Report (ABC) as a working-class grave digger with a sense of humour. Down-and-out, luckless, alcoholic chef Carl (Neill) takes a job in a seedy bar in Brunswick, where the basement kitchen is infested with pests. He soon learns that his kitchen-hand Mustafa (Lathouris) is a Turkish drug-dealer, and his Greek boss Yanni (Papademetriou) heads a pack of hit-men which also includes the angry Laurie (Brkic). His one saving grace is nineteen-year-old barmaid Sophie (Carides) - half his age, but incredibly beautiful - but it seems she's promised to Yanni. What's more, his elderly mother has come to visit.